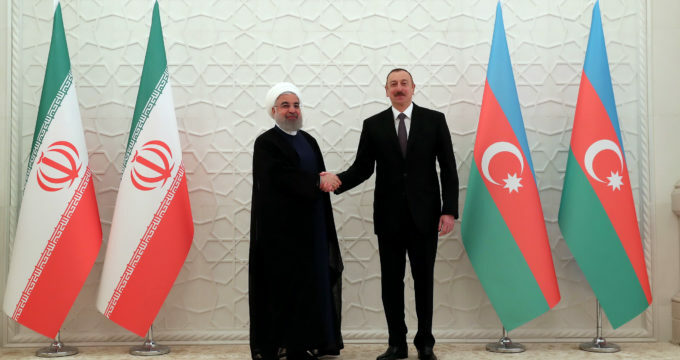 MNA – President of Azerbaijan Ilham Aliyev has congratulated Iranian President Hassan Rouhani on the occasion of the 40th anniversary of the Islamic Revolution’s victory. “Dear Mr. President, on my own behalf and on behalf of the people of Azerbaijan, I extend my sincerest congratulations to you and all the people of your country on the occasion of the national day of the Islamic Republic of Iran, the victory of the Islamic Revolution,” Aliyev said in his congratulatory letter. “Relations between the Republic of Azerbaijan and the Islamic Republic of Iran stem from the will of our people, who have historically lived in an atmosphere of friendship and good neighborliness. I am confident that our bilateral relations, mutually beneficial cooperation, which covers various areas, will continue developing and expanding,” the Azerbaijani president wrote. “On this festive day, I wish you the best of health, success in your endeavors, and the friendly and brotherly people of Iran everlasting peace and prosperity,” he added.